The road to, and parking access at this site can be undertaken in a 2WD vehicle in any weather conditions. The site can be accessed from either side of the Murray Valley Hwy. The bank slope is steep but the bank access to the water is good. The facilities at this site are limited to a park bench. Camping is prohibited within this site. 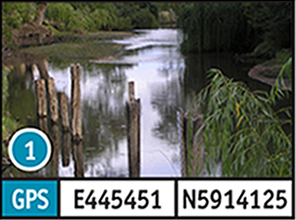 The turn off to this site is located 4.9km south-east of the Wodonga Post Office on the Murray Valley Hwy. The target species at this site is Murray cod. The road to this site is accessible in a 2WD vehicle in any weather conditions. Access and parking at this site should only be attempted in a 2WD vehicle in dry weather. The bank slope is steep and the bank access to the water is moderate. There are no facilities located here. Camping is prohibited within this site. The turn off is 19.4km south-east of the Wodonga Post Office along the Kiewa Valley Highway. 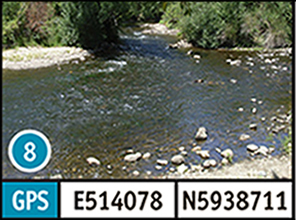 The access point (or parking) is a further 1.4km from the turn off on the Kiewa East Rd. The target species at this site are Murray cod and trout. The road to, and parking access at this site is good and can be accessed in a 2WD vehicle in any weather conditions. The bank slope is steep and the bank access to the water is moderate. Camping, toilet and picnic tables are available. 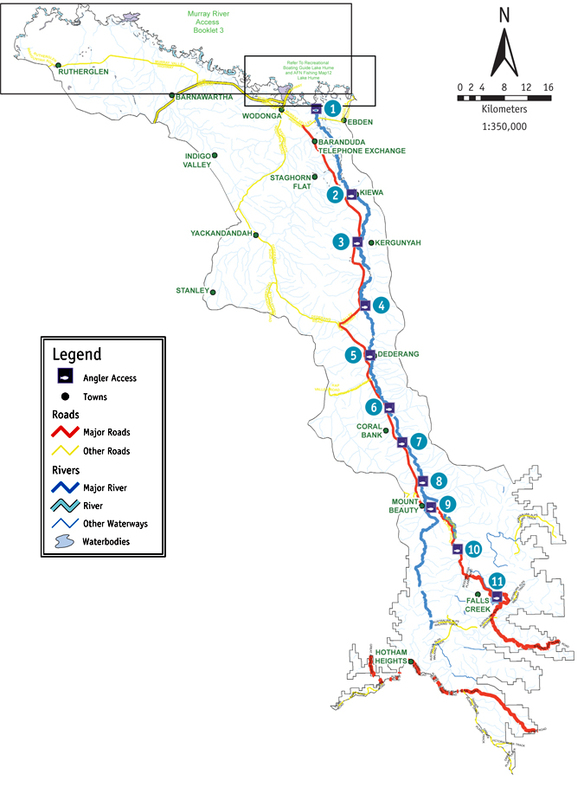 The turn off is 28.6km south-east of the Wodonga Post Office along the Kiewa Valley Highway at Kergunyah. The access point (or parking) is a further 500m along the Kergunyah Rd from that turn off. The target species at this site are Murray cod and trout. The road to, and parking access at this site is good and can be visited in a 2WD vehicle in any weather conditions. The bank slope is flat and the bank access to the water is good to moderate. Picnic tables are available and camping is allowed within this site. 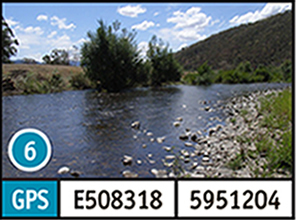 The turn off is 41.7km south-east of the Wodonga Post Office along the Kiewa Valley Hwy. The access point (or parking) is a further 1.1km along Boyds Rd from the turn off. The target species at this site are Murray cod and trout. The road to and parking access at this site is good and can be undertaken in a 2WD vehicle in any weather conditions. The bank slope is flat, and the bank access to the water is good to moderate. There are no facilities located here and camping is prohibited. 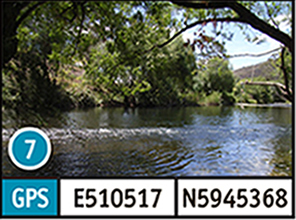 The turn off is 54.1km south-east of the Wodonga Post Office along the Kiewa Valley Hwy. The access point (or parking) is 1km along Keeghans Lane from the Kiewa Valley Hwy turn off. The target species at this site is trout. The road to, and parking access at this site is good and can be accessed in a 2WD vehicle in any weather conditions. The bank slope is flat and the bank access to the water is good. 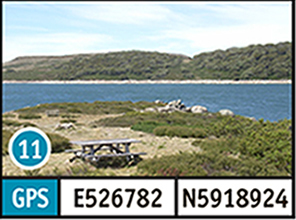 There are no facilities located at this site and camping is prohibited unless within the Caravan Park. 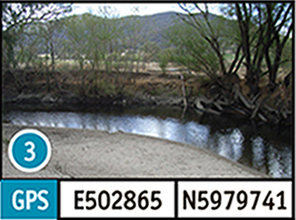 The turn off is 65km south-east of the Wodonga Post Office on the Kiewa Valley Hwy. The access point (or parking) is a further 400m along Bay Creek Road from the turn off. There are numerous opportunities for access to the water along this road. The target species at this site is trout. The road to this site is accessible in a 2WD vehicle in any weather conditions. Access and parking at this site should only be attempted in a 2WD vehicle in dry weather. The bank slope is moderate and the bank access to the water is good. There are no facilities available and camping is prohibited within this site. 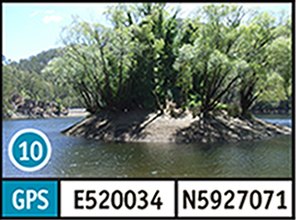 The turn off is 72.4km south-east of the Wodonga Post Office along the Kiewa Valley Hwy. The access point (or parking) is a further 400m along Redbank-Mongans Rd from the turn off. The target species at this site is trout. The road to, and parking access at this site is good and can be reached in a 2WD vehicle in all weather conditions. The bank slope is steep, with the access to the water being moderate. There are picnic tables and a fire/BBQ within this site. The turn off is 79.3km south-east of the Wodonga Post office along the Kiewa Valley Highway. The access point (or parking) is a further 1.2km along Mountain Creek Road from the turn off. This site is directly adjacent to the Tawonga Caravan Park. The target species at this site are trout and redfin. Mt Beauty Pondage: The road to, and parking access at this site is good and can be visited in a 2WD vehicle in all weather conditions. The bank slope is flat and the access to the water is good. 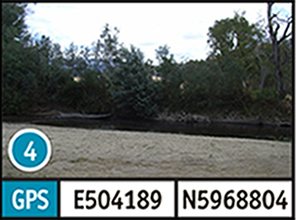 The boat ramp is dirt and should only be attempted in a 2WD vehicle in dry weather. The facilities at this site include toilets, picnic tables, walking tracks and a fireplace. 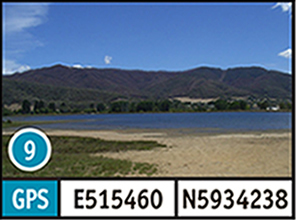 The turn off to this site is located in Mt Beauty, along the Kiewa Valley Hwy. Turn into Embankment Drive. There are numerous access points to the pondage along Embankment Drive. The target species at this site are trout and redfin. The road to, and parking access at this site is good and can be undertaken in a 2WD vehicle in any weather conditions. There is gravel boat access which should only attempted in a 2WD vehicle in dry weather. The bank slope is moderate and the access to the water is good. Facilities provided at this site include toilet, picnic tables and fireplace/bbq. It is located at Bogong Village which is 14.9km south-east of Mt Beauty Village on the Bogong High Plains Rd. The target species at this site is trout. The road to this site is accessible in a 2WD vehicle in any weather conditions. Access and parking at this site should only be attempted in a 2WD vehicle in dry weather. During winter months, there is no access to this site. There is gravel boat access which is only suitable for 2WDs in dry weather. The bank slope and the access to the water are moderate. 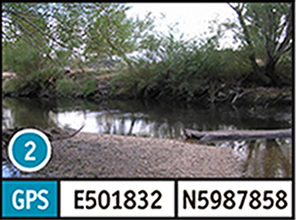 Bank fishing is the most popular way to fish this site. There are numerous picnic tables located around this site. The turn off is located 33.9km south-east of Mt Beauty along the Bogong High Plains Rd and 1.4km from the Falls Creek Township. The target species at this site is trout.